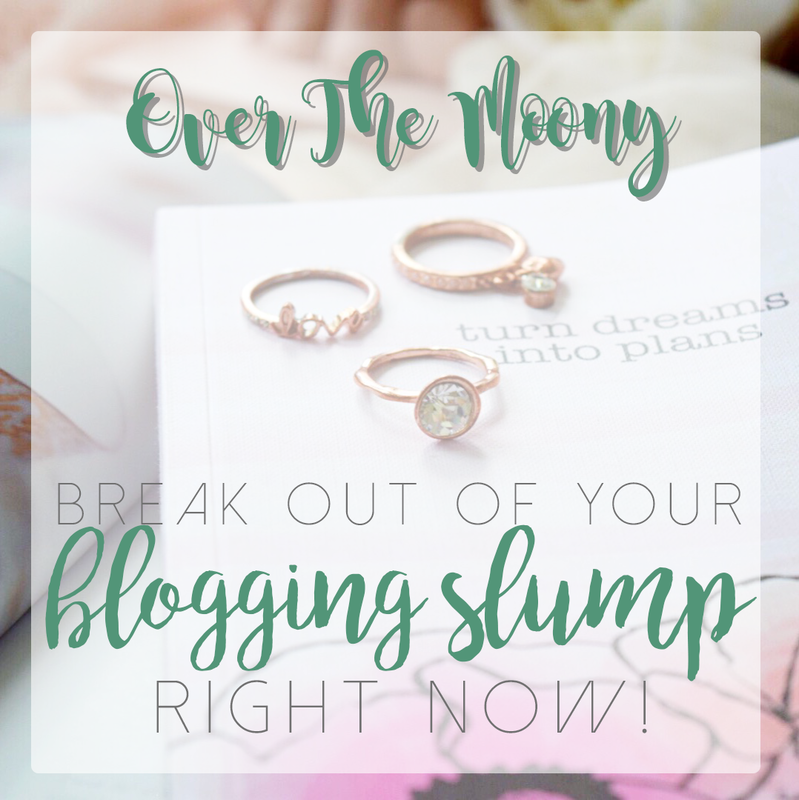 Over The Moony: Break Out of Your Blogging Slump Right Now! If you're a frequent reader of my blog, you may (or may not) have noticed that my blogging schedule has been changing a little bit. I was posting on Friday's and Tuesday's, then it went to Saturday's and Wednesday's and now we're at Sunday's and Thursday's. Except that today is Monday and there was no blog post yesterday. That is mostly because I was at the Pennsylvania Renaissance Faire all day yesterday and didn't get myself prepared for being away all day, but also because I had no idea what to write about. I have a different work schedule over the summer than I do the rest of the year. I work in an accounting firm and our busy season runs from January-April and August-mid October. After that things come to a mostly screeching halt and so our company allows us to work 4 day weeks from the beginning of June through the end of August. As you can imagine, this is awesome for obvious reasons, but it also takes a lot of adjusting when I have to go back to my normal schedule. Over the summer, I was super into getting myself prepared for blogging every week. John works Sunday-Thursday and goes out every Friday to do some shopping stuff with his friend so I had Friday and Sunday to work on the blog. I would take tons of pictures one day and write posts another day. It was awesome. Now that I'm back to a normal weekend and trying to cram everything into Saturday and Sunday, I'm finding that I don't have enough time on Sunday to do blog things because I'm busy just trying to clean or go do something with my Mom or just wanting to relax and knit. BUT. I will overcome, and guess what, so will you! Because if you are a fellow blogger (because who isn't nowadays, right? ), you probably get into blogging slumps, too. So today we're going to fight off the slump and get ourselves motivated all over again! I'm going to talk about some of the things that I usually find are the causes of my slump and what I do to overcome them and hopefully they will help you out, too. This happens to everyone. When you're trying to publish original content multiple times a week it gets a little hard to think up fresh new stuff off the top of your head. One of the things that I've taken to doing is bringing a notebook with me everywhere I go and writing down every single idea and thought that crosses my mind in it. It doesn't matter whether or not it's something that I actually think I would write about or not because it might spark a new idea. Another thing I absolutely love? Coming up with new series. It is my absolute favorite thing ever. Why? It's a gift that keeps on giving! You will always have something to write about. Last Sunday I started my Focus on Music series, which will be super easy to write every month. Like I said in that post, I'm obsessed with music and I'm always happy to write about it. Monthly Favorites/Recap posts are perfection because, again, it's something that you can write about every month! Sure, maybe you don't have a ton of new favorites, but new things are always happening in your life that you can write about. Plus it's a way to get people into one post to have them see all of your posts for that month (which means more traffic to older content). I also have my Girl Bosses In Pop Culture series, which will constantly be a joy to write since there are so many badass ladies around these days! And there are even more in my notebook that I haven't started. Series = Life savers. PLUS, if you're someone who doesn't mind pre-writing content, you can always have these on the back burner ready to go for those busy days in your life where you can't get a blog post together. MY CONTENT ISN'T HELPFUL/NO ONE IS READING IT. Another thing that is hard is finding a balance between sharing your life and the things you love and providing content that is going to be helpful to your readers. Once you're a more established blogger I think it's easier to get away with posts that revolve more around you and your life, but until you have a more dedicated reader base, people aren't necessarily going to come flocking to your blog to read a "10 Random Facts About Me"-type post. In my humble opinion, when you're starting out as a blogger, you want to be providing helpful content that is going to reel people in. For example, I posted about the Soho Gotham Girls Brush Sets available at Walgreens a couple weeks ago. That has steadily become one of my most popular posts. Why? Because it's helpful. It shows the brushes up close so people can decide whether or not they want to trek around to their local Walgreens to find them. Reviews are the thing to post when you feel like your blog is going through a hits slump. I used to have a makeup blog and I would live at the drugstores so that I could find new products and get reviews up early. I also do unboxings for the same reason. Subscription boxes are huge and often people aren't going to put their money into a subscription box unless they know they're going to like what's inside. Again, on my old blog, I would unbox my Birchbox, Glossybox and ipsy bag every month and get all sorts of traffic. It was so easy. 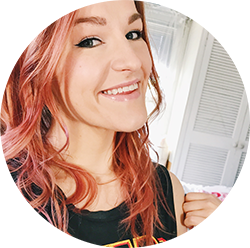 Now I pretty much only do it with my Geek Gear Harry Potter box but if you're a subscription box addict, add in some unboxings to your content! They're SO easy to do and they have good payoff, which will in turn make you more motivated as you see your hits rise! I DON'T HAVE GOOD LIGHTING FOR PHOTOGRAPHY. This is something that I'm running into now that I've lost my extra day to take my pictures. I used to work all day on Friday or Sunday and just batch take tons of pictures in different setups with great light. Now if I need to quickly photograph something, especially with the days getting shorter, it's a little harder for me to get good pictures when I get home from work. That's why I really recommend trying to take a bunch of pictures in one day. You'll have great stock photography for the whole month in just a matter of hours. This won't solve all of your problems, but at least it will help! The other plus about this is that you'll have a stock of pictures at the ready to use on Instagram as well! You're really killing two birds with one stone. The only downside to this is that it certainly can feel a little more like a chore than art. Sometimes I think it takes a little bit of the fun out of it when you have a set day to take pictures as opposed to letting creativity strike. If you're lacking, go on Pinterest or Instagram and browse around for a little bit. You are absolutely bound to find some inspiration. But if you are someone who just can't take hours at a time to take a ton of pictures, I would highly suggest investing in some nice studio lighting, or at the very least, daylight bulbs. There are ring lights and soft boxes available on Amazon that can certainly help you out in your unfavorable lighting conditions should you need them. I hear you, my friend, if you are struggling with feeling like you don't have the best equipment to work with. The computer that I'm working with at home is one that I won in a raffle at work that is probably 5 or 6 years old at this point. There are all sorts of lines down the center of the screen but it works! It just isn't terribly fast or bright or necessarily the best tool for editing photos. I really only use it to type up my blog posts and make my pinnable banners in Photoshop. Otherwise, everything else is done on my phone, which is totally fine given how advanced phones are nowadays. I do all of my photo editing in the app A Color Story, which has a ton of great filters and editing options. And, of course, you can totally use your phone as your camera if you can't afford to get a DSLR. I invested in one over the summer, and it was honestly the best investment for my blog (and my own personal photography) that I could have made, but that isn't in everyone's budget. Your phone is obviously a great substitution. While it has it's limits, it also has it's strengths and there are so many different apps out there that can help you get professional images. Fun Fact: The less storage space you have on your phone, the worse quality your pictures will come out. If you take a lot of photos on your phone, think about getting a higher GB phone so your picture quality will always be good! MY BLOG IS NOTHING COMPARED TO [OTHER BETTER BLOG'S NAME HERE] SO WHY BOTHER? Ah, comparison. Truly the thief of joy, no? I'm not going to sit here and tell you to stop doing it because I truly think that it is one of the most impossible things ever. It just seems that we as humans are never happy with what we have, even if we have the stars and the moon in our pocket we'll want the whole galaxy and the next one and the next. We always want more and we always want to be the best (or at least me, as an Aries, always does). I have a terrible time of thinking that my blog is never going to be as good as any of the ones that I read on a regular basis. The ones that are giant successes, even though I would love nothing more than to have this be my job and be my own boss. It'd be fantastic! But I find myself getting down on myself because I don't feel like my content or my photos or any part of my blogging/social media presence is good enough. And I know I'm not alone. Being a part of this digital world where you can see so much more than you used to be able to before is daunting. However, why don't we take that comparison and turn it on it's head? Let's turn it into inspiration! Instead of thinking [Insert Blog Name Here] is SO MUCH better than me, I'll never be able to be that good, think [Insert Blog Name Here] is amazing. What aspects can I get inspired by and infuse into my own blog? It can be as simple as the way someone's side bar looks or their structure in their blog posts to something as major as content. And again, this is being inspired, not copying directly. We frown upon that pretty heavily! If I can give a small example, let's take a trip back to my last post where I was talking about my lettering journey. I've been taking part in a Harry Potter Lettering challenge where every day there is a new prompt and you letter something related to it. I'll create something and post it, and then look through the hashtag and feel completely defeated because of how amazing other people's work is, which in turn pushes me to do something different the next day and the next. This past Friday I got quite down on myself about my lettering. I had worked on it for hours. I was sketching it out and practicing it at work and then put it on good paper with nice markers when I got home. I posted it, I looked at other people's and instantly felt like it wasn't good enough and would never be good enough and I would never get my work featured on the daily wrap-up post that one of the hosts does because it's no good compared to everyone else's. John just kept telling me it was good and fancy and he liked it and I was doing a nice job. Don't you know the next day I woke up to an Instagram notification that I had been tagged in a photo by the host who does the daily wrap-ups? I instantly jumped on Instagram before I even got a chance to snuggle with Lupin, and sure enough, I had been featured. I was floored and so happy! It goes to show that even if you might not think you're good enough, someone else probably does. So just keep working and trying! Don't give up! What do you do to overcome blogging slumps? Share some of your tips in the comments below! Share this post with someone who might need a little inspiration of their own!